﻿This is the "Bible" on positive reinforcement training, or operant conditioning, and how it works - with people, and of course with animals. Fun to read too! Over 300,000 in print. 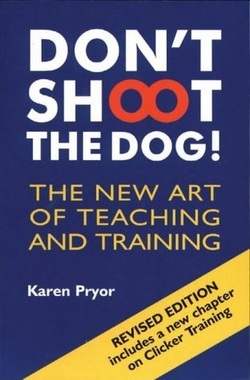 ​Karen Pryor's clear and entertaining explanation of behavioral training methods made "Don't Shoot the Dog" a bestselling classic! Now this revised edition, published by Bantam, presents more of her insights into animal and human behavior.